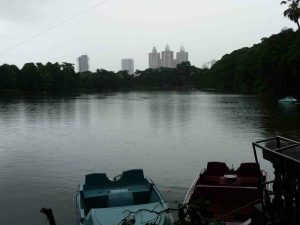 Chhota Kashmir is a small lake present in the Goregaon area of Mumbai city. This wonderful lake is a hugely popular place for boating. Lake is surrounded by lush greenery which is the home to many bird species like Parrots, Cuckoo, Sunbird etc. The name Chhota Kashmir comes from the “Dal” lake of Kashmir. Just like Dal lake, you can enjoy the paddle boating in this lake also. There are some other activities like a mini train, mini-copter which were designed for children. is a perfect place to spend some quality time with your family and friends. You can visit this place on all weekdays between 9:00 AM to 6:30 PM. Festival season and holidays may affect the timings. During summers, try to avoid visiting in the afternoon. 1 hour of visiting duration is required to visit this place. Entry is completely free but visitors need to pay Rs.20 per person boating charges for 30 minutes. Camera charges are Rs. 20 per camera. Address: Aarey Milk Colony, Goregaon East, Mumbai 400065, Maharashtra. Nearest Railway Station: Goregaon railway station is the nearest railway station to reach here. It is situated at the distance of approx. 3 kilometers from the lake. You can take a taxi or auto from railway station to lake. Nearest Bus Stop: Chhota Kasmir Police Station bus stop is the nearest bus station from the lake. You need to walk for 160 meters from the lake to reach this bus stop. Nearest Airport: Mumbai airport is the nearest airport to reach here. Distance From Thane: It is located 24 kilometers away from the Thane. October to May is the best season to visit this wonderful lake. But as I said earlier, try to avoid visiting in the afternoon during summers. Our Review: If you are in search of a beautiful and peaceful location in this crowded and noisy city then this is the ultimate location to enjoy with your family and children.